They wear the latest and most advanced body armor and helmets, camouflage gear and anti-ballistic sunglasses: the fashion statement favored by frontline private security companies across the world’s combat zones. Blackwater fighters are in Syria training terrorists who have found a new way of cashing in on the self-styled “caliphate”. Blackwater became the most high-profile of Western ‘security’ contractors in Iraq, gaining notoriety as the most violent and aggressive of the corporate military firms that spotted a highly lucrative trade following the “liberation” of the country in 2003. Such firms were largely immune from scrutiny or prosecution: that changed after a particularly bloody day in Baghdad. The small group, of about a dozen drawn mainly from Central Asia, has been an enthusiastic user of social media. At the end of 2016, it placed advertisements in Facebook looking for instructors who were prepared to “constantly engage, develop and learn”. The company’s YouTube pages provide free guides ranging from weapons maintenance and laying ambushes to battlefield first aid. The leader and founder of the term Malhama, a private military contractor that means business and a firm which is “fun and friendly” according to its online brochures – is an Uzbek using the nom de guerre Abu Rofiq who claims to have served in the VDV, a Russian military airborne unit. Although it was a commercial concern, Rofiq has stressed the religious aspect of its work meant helping “oppressed Sunni Muslims” militarily, beyond Syria. Chechen and other Caucasian groups have been active in other fronts, carrying out attacks in Russia and states allied to the Kremlin in the region. Blackwater’s training and arming of the militants had begun as a slow and often chaotic process in Syria. As the uprising descended into a vicious bloodbath, the flow of arms into Syria went up massively in quantity and quality. Some “moderate” opposition fighters trained and armed by the Americans in Jordan and Turkey surrendered with their weapons to extremist groups on crossing the border. Abu Rofiq is said to have seen the training opportunities for terrorists after first going to Syria in 2013. He began to bring in experienced fighters from the Caucasus before starting Malhama with a dozen others in the beginning of 2016. 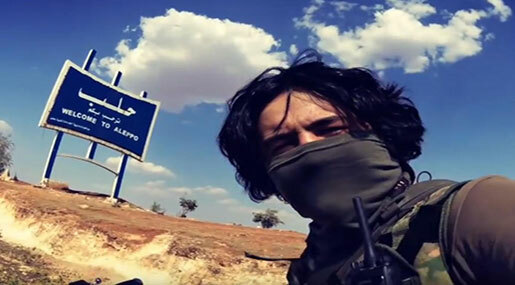 The company has been working with Jabhat Fateh al-Sham, the new name taken by al-Nusra Front, the al-Qaeda affiliate in Syria, as well as Ahrar al-Sham, a terrorist group which had been backed by Turkey and Saudi Arabia. There has been a strong presence of extremists from the Caucasus in Syria for a while. They have built up a reputation as the fiercest and most dedicated of the foreign fighters. One of the most effective military chiefs of Daesh was Abu Omar al-Shishani – of Chechen and Georgian background. He was killed in July last year in a US airstrike in the town of Al-Shirkat in Iraq – a significant loss, the terrorists acknowledged, to their leadership.